If you know what people want, then you can always negotiate a deal with them that favor both parties. Using trade and barter as a new form of currency to pay for goods and services is opening the door to a whole new market of potential customers without using traditional cash, credit, or checks. This form of exchange can do you and your business a lot more good than you think. 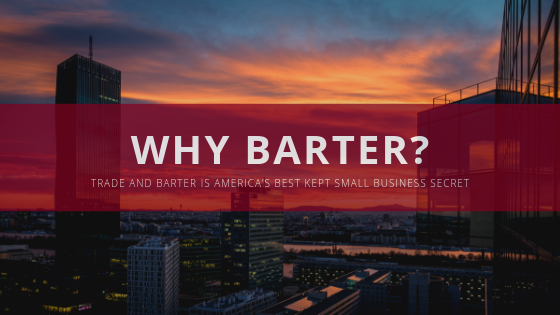 Trade and Barter is America’s Best Kept Small Business Secret! When you trade and barter, you are utilizing those empty seats, tables and lost appointments you would have lost forever. The incremental cost of offering that business through trade and barter is at your wholesale cost. The sales transaction you get credit for is at full retail value. Once your transactions are posted to your Trade Club Account, whatever you decide to spend in the network, will be at your wholesale cost of providing that service. That is the power of trade and barter, converting that potentially lost business into purchasing power. When you trade and barter, you don’t have to use any of your actual profits to pay. Trade any extra products or time you may have for other goods and services. You are going to need your cash when the business is having a pause, something that happens to every business. Trade your goods and services for other goods and services; once you begin working with the trading system, you’ll never have to wonder why barter is a good idea. Most of business owners start spending on professional services that they used to do in-house or did not have the budget to purchase for cash. The result is that trading will help your business expand professionally in the market place. Whether you are bartering online or bartering one-on-one, you are allowing other potential customers to experience your business in exchange for their extra time or goods. Once they have good experiences with your services or goods, you can expect that their recommendations to others will get you new business. You can’t underestimate the power of word-of-mouth advertising and bartering is a great way to do that while getting something back in trade. Within a Trade Club, you will be working closely with a trade broker. His trade directory will make it easy for you to exchange goods and services, particularly when you do online bartering. A trade directory will list extra details, as well as the value, for the services and goods you’re trading. You’ll always know what you’re getting out of your deal, and you can also easily search a trade directory to find what you need. Many people think of bartering as a short-term solution which is generally true but when carried out properly the parties involved will develop credible relationships that can be used in the future. It’s a creative way to save money and can help establish good connections with suppliers, vendors, referral sources, etc.